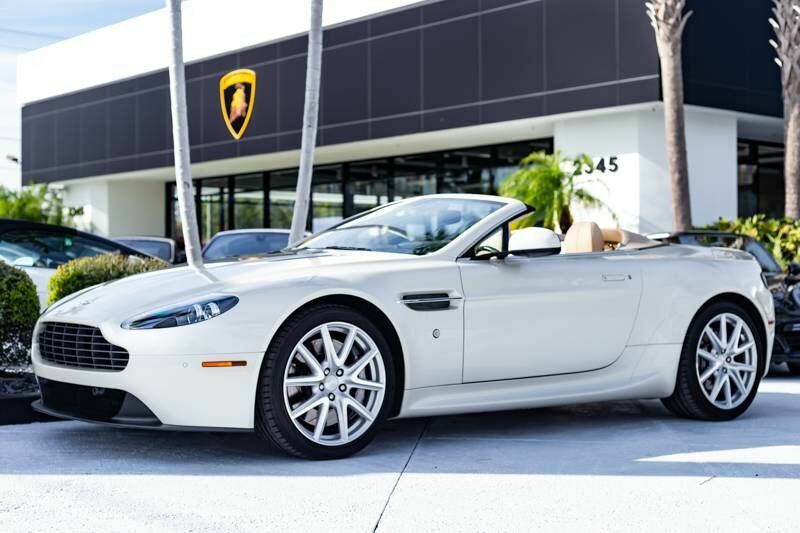 This 2015 Aston Martin V8 Vantage is offered to you for sale by Lamborghini Palm Beach. This Aston Martin includes: WHEELS: 19" Aluminum Wheels OTHER MANUFACTURER SPECIAL PAINT COLOR SILVER BRAKE CALIPERS MEMORY SEATS Mirror Memory Seat Memory MATCH TO SAMPLE SPECIAL ASTON MARTIN PAINT COLOR MEMORY SEATS Mirror Memory Seat Memory CONTEMPORARY LEATHER COLOR FRONT PARKING SENSORS Rear Parking Aid CONTEMPORARY CONVERTIBLE ROOF COLOR OTHER MANUFACTURER'S PAINT COLOR GLASS SWITCHES BAMBOO FASCIA TRIM Woodgrain Interior Trim CLEAR REAR LAMPS STANDARD PAINT FINE CONTRAST STITCHING SPECIAL AML COLOR MATCH TO SAMPLE SPECIAL ASTON MARTIN PAINT COLOR MORNING FROST WHITE TRANSMISSION: 7-SPEED MANUAL W/SPORTSHIFT II *PRICE TO FOLLOW* Transmission w/Dual Shift Mode 7-Speed A/T A/T CARPET MATS Floor Mats CONTEMPORARY COLOR HEADLINER CLEAR REAR LAMPS REAR PARKING ASSIST CAMERA *PRICE TO FOLLOW* Back-Up Camera 700W ASTON MARTIN PREMIUM AUDIO SYSTEM W/DOLBY PRO LOGIC II Premium Sound System WHEELS: 19" Aluminum Wheels COLOR-KEYED LEATHER SPORTS STEERING WHEEL Leather Steering Wheel LUXE PACKAGE Heated Front Seat(s) Premium Sound System PERSONALIZED SILL PLAQUES GLASS SWITCHES OUT-OF-RANGE/MATCH TO SAMPLE LEATHER COLOR GAS GUZZLER TAX REQUIRED CONTEMPORARY CARPET COLOR BAMBOO FASCIA TRIM Woodgrain Interior Trim CREAM TRUFFLE, FULL-GRAIN LEATHER SEAT TRIM Leather Seats 700W ASTON MARTIN PREMIUM AUDIO SYSTEM W/DOLBY PRO LOGIC II Premium Sound System CRUISE CONTROL *PRICE TO FOLLOW* Cruise Control ALARM UPGRADE *Note - For third party subscriptions or services, please contact the dealer for more information. * Drive home in your new pre-owned vehicle with the knowledge you're fully backed by the CARFAX Buyback Guarantee. Enjoy an extra level of calm when purchasing this Aston Martin V8 Vantage , it's a CARFAX One-Owner. The CARFAX report shows everything you need to know to confidently make your pre-owned purchase. Those shopping for a sporty convertible would be wise to check out this Aston Martin V8 Vantage . With the versatility to easily switch between open-air and closed-cabin driving, it's hard to ignore the everyday practicality of this V8 Vantage. Pull up in the vehicle and the valet will want to parked on the front row. This Aston Martin V8 Vantage is the vehicle others dream to own. Don't miss your chance to make it your new ride. It's not a misprint. And the odometer isn't broken. This is a very low mileage Aston Martin V8 Vantage. A rare find these days. Marked by excellent quality and features with unmistakable refined leather interior that added value and class to the Aston Martin V8 Vantage If you're looking for a one-of-a-kind automobile, look no further. No matter the season or weather conditions, the tires on this Aston Martin V8 Vantage can handle the job. Class defining, one-of-a-kind options are the standard with this Aston Martin V8 Vantage plus much, much more. High performance is what this vehicle is all about. You will be reminded of that every time you drive it. Clean interior? How about flawless. This Aston Martin V8 Vantage looks like has never been used. Rest assured, this vehicle was well care for. In fact, previous service records are included. This Aston Martin V8 Vantage has a flawless finish that complements its wonderful interior. The standard wheels have been upgraded to gives this vehicle a whole new style. More information about the 2015 Aston Martin V8 Vantage: The Vantage is the most affordable car from Aston Martin, and it is neither a light-and-lean roadster nor a performance-oriented grand touring coupe. Rather than taking on other exclusive high-performance cars, it's positioned against other sport-touring models like the BMW M6, Mercedes-Benz SL63 AMG and Jaguar XKR-S. A simplified, more "honest" driving experience is one argument for the Vantage, in this age of seemingly endless custom settings in some models for driving characteristics. EPA fuel economy ratings for the V8 Vantage, at 13 mpg city, 19 highway, aren't bad, considering this car's performance focus and traditional V8 engine. 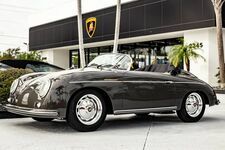 Strengths of this model include a shape that looks great in coupe or roadster form, opportunities to customize, and Mighty powertrains with strong acceleration Come join our family at Lamborghini Palm Beach, where your buying experience is most important to us.